Home is where the heart is. Your Zeitwohnhaus. Feel at home while you are away. Individual service. Every day. For every guest. 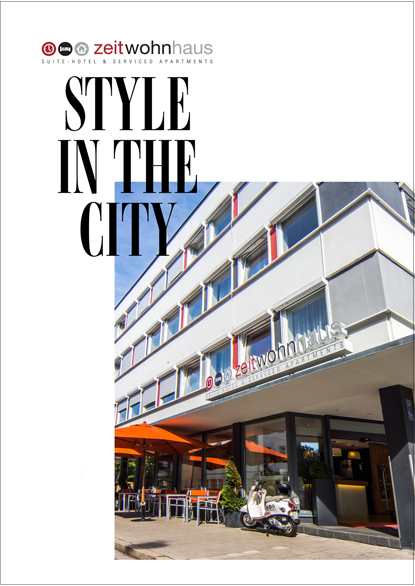 The Zeitwohnhaus is a lifestyle-apart-hotel in the centre of Erlangen. Our 66 individually designed hotel rooms, premium-suites and serviced apartments with fully equipped kitchens are ideal for both shorter and longer stays. Whether you are travelling on business, privately or for medical reasons, there are many reasons to visit us. For us, the most important thing is you. It’s good to have you as our guest. Right in the middle of things. 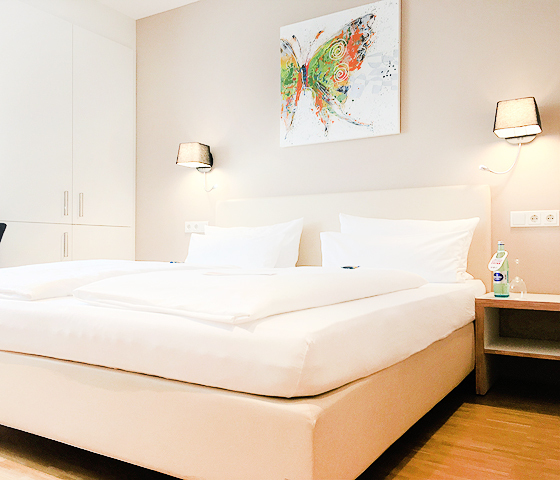 You can stay in the centre of Erlangen near the university and all the hospitals. Just a few minutes away from the SIEMENS head office, SIEMENS Training Center & the Healthineers headquarters. Experience the Old Town, many restaurants, cafés and Erlangen’s ARCADEN – all just a stone’s throw away. Enjoy complete privacy in our modern hotel rooms, suites or serviced apartments with fully equipped kitchens in Erlangen’s top location. 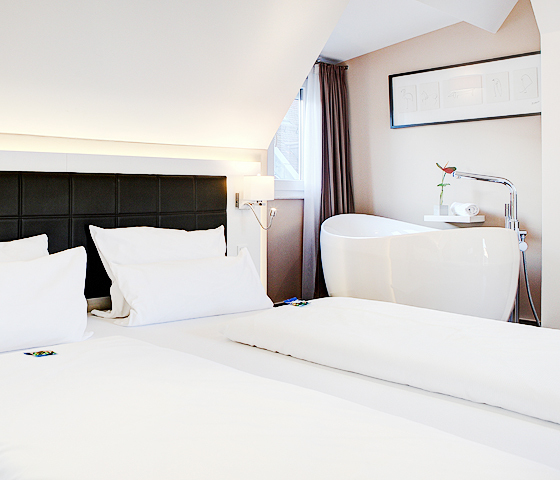 YOUR Zeitwohnhaus Enjoy complete privacy in our modern hotel rooms, suites or serviced apartments with fully equipped kitchens in Erlangen’s top location. Free 300 Mbits wifi and LAN, 400 international daily newspapers, SKY TV free of charge, Meeting Point, Business Corner & laptop safe – this is how business travel should be. YOUR Business Hotel Free 300 Mbits wifi and LAN, 400 international daily newspapers, SKY TV free of charge, Meeting Point, Business Corner & laptop safe – this is how business travel should be. For guests who book directly on our website, by email or telephone, we guarantee the absolute lowest price in any category, at any time. It’s worth it! YOUR Best Price For guests who book directly on our website, by email or telephone, we guarantee the absolute lowest price in any category, at any time. It’s worth it! For SIEMENS, the university, the Old Town and everywhere else. The Zeitwohnhaus is located in the heart of Erlangen. The perfect home base for anything you want to do. YOUR Starting Point For SIEMENS, the university, the Old Town and everywhere else. The Zeitwohnhaus is located in the heart of Erlangen. The perfect home base for anything you want to do. The longer you stay, the less it will cost. Take advantage of our Longstay advantages and pay only for the things you really need. YOUR Extended Stay The longer you stay, the less it will cost. Take advantage of our Longstay advantages and pay only for the things you really need. SUITE-PAD In-Room entertainment for Surfing, streaming, gaming, networking & reading, X-Box & Playstation rental, flat screens with SKY & international TV. YOUR Room Entertainment SUITE-PAD In-Room entertainment for Surfing, streaming, gaming, networking & reading, X-Box & Playstation rental, flat screens with SKY & international TV. Delicious breakfast buffet, urban bistro with organic soups, club sandwiches and coffee & cake or a chic hotel bar for unwinding in the evening. Always worth a visit. YOUR Zeitlounge Delicious breakfast buffet, urban bistro with organic soups, club sandwiches and coffee & cake or a chic hotel bar for unwinding in the evening. Always worth a visit. Cook for yourself in your own apartment, rent a bike or scooter, enjoy our laundry service, bread-roll service or our 24/7 shop. You can relax; we’ll take care of the rest. YOUR Temporary Home Cook for yourself in your own apartment, rent a bike or scooter, enjoy our laundry service, bread-roll service or our 24/7 shop. You can relax; we’ll take care of the rest. 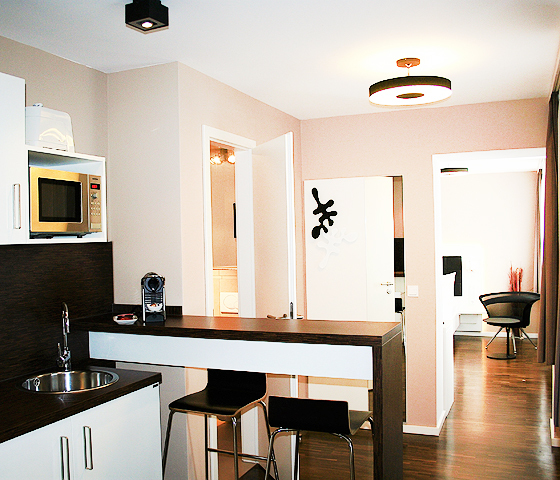 Our apartments are furnished with fully equipped kitchens including a starter kit, kettle and Nespresso coffee machine. Just like home. YOUR Apartment Kitchen Our apartments are furnished with fully equipped kitchens including a starter kit, kettle and Nespresso coffee machine. Just like home.